The Berrywood community in Severna Park, Maryland was alarmed with the deteriorating water quality in Cattail Creek. 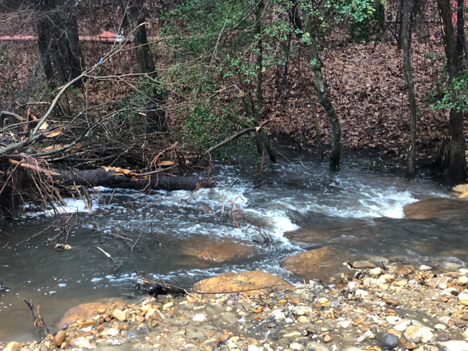 It has been ranked year after year as having the worst water quality of any creek in the Magothy River Watershed according to Bob Royer, a Berrywood resident and volunteer water quality monitor for the Magothy River Association. The Berrywood Community Association (BCA) saw future development upstream as a further threat to water quality and destruction of habitat for fish and wildlife such as Yellow Perch and the Great Blue Heron which make Berrywood their home. The construction team led the BCA through bi-weekly progress reviews of the site, called Community Construction Progress Meetings. Donna An, pictured left, from Actaeon, LLC, was the construction manager on behalf of AAWSA that led the meeting that day. Credit: Robert Royer. Empowered by her new role as a Steward, in 2015 she started looking for grant opportunities that could fund her restoration project. At an WSA event, she met a representative from Maryland Department of Natural Resources who said that their project would be a good fit for their funds. 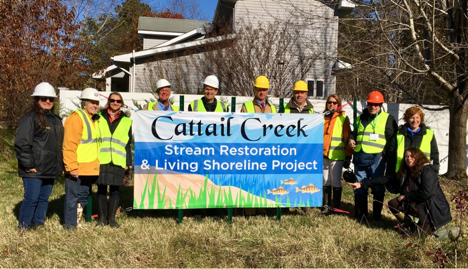 Chesapeake Bay Trust with Anne Arundel County Department of Public Works and Maryland DNR provided the funds in 2016, and Underwood & Associates was awarded the design and construction of the stream restoration. Construction of the site began in October of 2018 with a three-part approach. Wood from trees on site is left in the stream. The carbon plays an important role in the restoration process. Credit: Robert Royer. First was the installation of a regenerative stormwater conveyance system which includes raising the creek bed to increase floodplain connectivity and uses weirs to slow down and widen the stream flow and reduce erosion. Second was removal of the bulkhead along the marina replacing it with a living shoreline surrounded by several large bioretention areas. Third was the construction of several rain gardens to capture and treat runoff from a nearby access road, parking lot, and basketball court. Cattail Creek runs clear after the restoration. Credit: Robert Royer. “The restoration will be a teaching opportunity for members of the community to become better stewards of the environment by increasing their awareness of the critical importance of planting native and pollinator friendly plants in their own gardens, saving their tall canopy trees and forested areas, minimize their use of fertilizer and pesticides and manage their stormwater through use of bioretention areas and rain gardens,” said Royer. Restoration Team including Berrywood Volunteers, WSA Leadership, MD State DNR and Underwood Associates and County Executive Steuart Pittman. Credit: Robert Royer. Boulders cobble and sand are used to create weirs to slow the water down and spread it out. Coarse woody material from downed trees provides a necessary carbon source for new life to flourish. Credit: Robert Royer. Reconnection of the stream to the floodplain allows for nutrient uptake and sediment reduction. Credit: Robert Royer.